Southwest China's Tibet Autonomous Region is the country's new gateway to South Asia, which is expected to play an important role in China's "One Belt and One Road" initiative. As trade between China's Tibet and Nepal has grown, local authorities have stepped up efforts to integrate the autonomous region into the South Asia Economic Corridor. Domestic media has recently spotlighted a trade route between China's Tibet and Nepal and an expansion of railway freight services to the country. The Global Times reporter recently traveled to Tibet to look into how those efforts have turned out. This is the first part of a two-part story. On a recent sunny Thursday morning in Gyirong county in Southwest China's Tibet Autonomous Region, dozens of workers busily loaded crates of apples onto a truck bound for neighboring Nepal. Chinese apples are in demand in India, and more and more Chinese companies have started shipping the fruit through Nepal. Gyirong county sits in forested valley in a remote part of the southern Himalayas. The county has the feel of a border town. It is full of little restaurants and hotels that serve the truck drivers who pass through day and night. Gyirong is located on a highway that runs to Nepal's capital of Kathmandu. The 130-kilometer stretch of road serves as a gateway to South Asia for many Chinese who make a living in the trade business. Trade between China's Tibet and neighboring Nepal has taken off in recent years. After a deadly earthquake hit Nepal in April 2015, demand surged for imported food, clothing and other necessities. In 2016, the autonomous region's exports to Nepal jumped 11.9 percent to 3.6 billion yuan ($522.95 million), according to a report that Lhasa Customs sent to the Global Times on April 17. Meanwhile, the region imported 898 million yuan in goods from Nepal, up 2.1 percent from the previous year. When the weather is good, hundreds of Nepalese trucks pass through the Gyirong port each day. The trucks carry a wide variety of products, including perfume, handcrafts, electronics, fruits and vegetables. The port is about 20 kilometers from the border, but truck drivers often spend hours delayed on the route due to the landslides that have regularly occurred since the earthquake. "If the condition of the road was better, we could deliver a lot more," said a 30-year-old driver from Kathmandu surnamed ­Nyaupane, who was waiting at the inspection customs zone on his way to the port on Thursday. 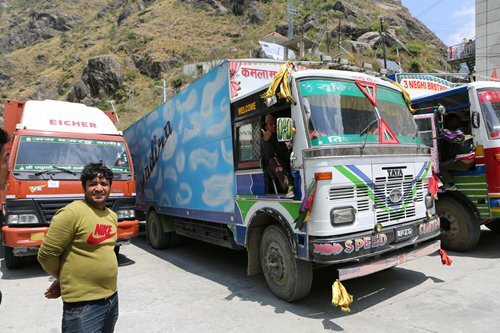 While Nepalese trucks can enter Gyirong county, they typically just shuttle goods to and from Nepal. For Chinese trading companies, having Nepalese trucks transport the goods into Nepal is cheaper than doing it themselves, said a Chinese businessman who has been trading with Nepal and India for more than two decades. The businessman wished to remain anonymous. Despite the poor road conditions, trading freight volume at Gyirong port surged 583 percent in 2016 to 104,500 tons, according to Gyirong Customs. The growing border trade reflected the local government's efforts to integrate the autonomous region into China's "One Belt and One Road" initiative and transform the Gyirong port into a gateway for trade with Nepal and India, said Hu Hong, head of Gyirong county. Local authorities have allocated more funds to improve the road to the port, as well as its checkpoints. "We have also raised 80 million yuan to improve the inspection zone and related facilities, etc," Hu told the Global Times on Thursday. Tibet is about three times the size of California. Its size, mountainous terrain and wide variety of climates have made infrastructure development a challenge. Although a railway connects Tibet's capital of Lhasa with the central city of Xigaze, which provides convenience to Chinese businessmen, any cargo heading south needs to be hauled by truck. And it takes about 15 hours to drive from Xigaze to Gyirong. For traders doing business with Nepal, taking the road from Xigaze to Gyirong is unavoidable. Some are clothing exporters based in South China's Guangdong Province or East China's Zhejiang Province. It takes more than 40 days to ship products by sea to Nepal or India. One alternative is to transport goods by rail from Guangzhou, capital of Guangdong, to Lanzhou, capital of Northwest China's Gansu Province, then by road from Lanzhou to Gyirong, which takes 15 days, according to the veteran businessman. "So when a new design comes out, they can sell their products to Nepal or India as quickly as possible," he told the Global Times. For those who ship apples to Nepal, which are later transferred to India, road transport is much faster than by either rail or by sea. 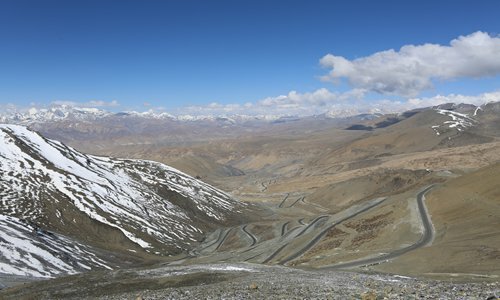 However, drivers have to traverse a rough road that will take them to an altitude of over 5,000 meters in the Himalayas. Still, the last 20-kilometer stretch of road from Gyirong county to the border is widely considered the most dangerous part of the journey. Looking down from one stretch of road built into a cliff, an abandoned Nepalese truck can be seen amid the evergreen forest below. "We have accidents here all the time, and construction workers are doing their best to improve the roadway, so now the traffic control takes hours," Qi Mei, an employee from the port authority, told the Global Times on Thursday. When traffic control officers stop drivers, they can spend an entire night waiting outside the port's checkpoint. Frequently, a long queue of trucks makes this narrow road even more difficult to traverse. After the earthquake in Nepal shut down Zhangmu port, the largest business port in Tibet, about 80 percent of the freight was redirected to Gyirong, said Dan Zeng, deputy director of Gyirong Customs, told the Global Times on Thursday. At the Gyirong Customs offices, which are hidden behind several dilapidated buildings, Wang Fei, an employee from the customs offices, sat in front of a computer checking clearance documents online. "The clearance procedures can now all be done online," he told the Global Times. "We review all the paperwork that a company submits to our system, so its representatives do not need to come to the office in person." Although authorities have been improving customs services while enhancing the effectiveness of the port, less developed transport, inspection and clearance conditions across the border have become a bottleneck for further development, said Hu, the county head. There is a large border gate on the Chinese side of the port. On the Nepalese side, there is a tent to receive trucks and visitors on their way across the border. Landslides occur even more frequently on the Nepal side of the border, and it usually takes Nepalese authorities months to clear the way due to a lack of funding. "There needs to be more diplomatic efforts, but it takes time," the veteran businessman said.